Grounding Essential Oil is a very emotional relaxing oil that contains seven therapeutic grade oils. This oil will stabilize and calm a person or animal on first application. This is a good oil for those who make poor choices in relationships, work or home because they simply are in denial of their own true reality. Many times this happens because we just don't know how to deal with the emotional component so we get stuck and can't move forward. This oil can help. I like to use it at the barn for horses that are either panicky or restless. Often times when they are placed in a chaotic situation they pick up on this energy and they don't know how to deal with it. I find that Grounding oil helps in this capacity; and usually I will combine it with an oil such as Clarity or Brain Power for mental concentration. I always find people that are drawn to this oil that are in their own world, tend to "space out" and can't focus on their work 100%. Like with the horses, I combine it with Clarity and they seem to become more industrious right away! This is an easy reference guide for Grounding Oil Blend. It will tell you how to use your oil blend and what to use it for. It will also provide you with some fun tips and testimonials! Want to Purchase Therapeutic Grounding Essential Oil? Go to the Oil Shop! Buy Grounding Oil Here! What is in Grounding Essential Oil? 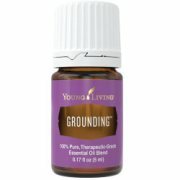 There are seven therapeutic grade essential oils in Grounding. They are listed below along with a brief description of each oil. Ylang Ylang Essential Oil (Cananga odorata) has a long history in skin and hair care products, particularly in Asia, where it is used to promote healthy,luxuriant hair. It also restores confidence and equilibrium. Juniper Essential Oil (Juniperus osteosperma) It may work as a detoxifier and cleanser, is beneficial to the skin, and supportive to the urinary system*. White Fir Essential Oil (Abies concolor) is very grounding and anchoring. It relaxes the body, while stimulating the mind. Pine Essential Oil (Pinus sylvestris) first investigated by Hippocrates, the father of Western medicine, pine is soothing for muscles and joints when used in massage or after exercise. Eucalyptus globulus shares some of the same properties, and the action of both oils is enhanced when they are blended. Angelica Essential Oil (Angelica archangelica) the "Oil of Angels" and helps to provide a feeling of safety and security. It is emotionally balancing. What are the Documented Uses for Grounding Essential Oil? Anger, balance, clearing, confusion, despair, disappointment, emotional upheaval, grounding, overwhelmed, fear, rejection, shock, spacing out and transition in life. What is the Aromatic Affect on the Mind? This aroma is balancing and stabilizing for the emotions. What is the Spiritual Influence? Grounding essential oil will help those who are bored or feel lost. It will help to stabilize the emotions and help us deal with the challenges that are in front of us. Sometimes when we are in shock or things that are happening in our lives that we don't know how to deal with, we may disconnect and wonder in our own world. Grounding oil will help us to come back to reality and help us make choices that enable us to move forward. What Chakra is Affected? Opens the heart chakra. Can this oil be used for Animals? Yes, definitely. I have used it to calm panicky horses and relax horses that need stabilizing. What are the Safety Precautions? Could result in skin irritation; therefore, dilution may be necessary. Generally safe for children over 2 years of age. For best results, place on the back of the neck and the temples.